Discussion in 'The Lounge' started by H8R, Mar 8, 2008. Saw this at the local hardware store. 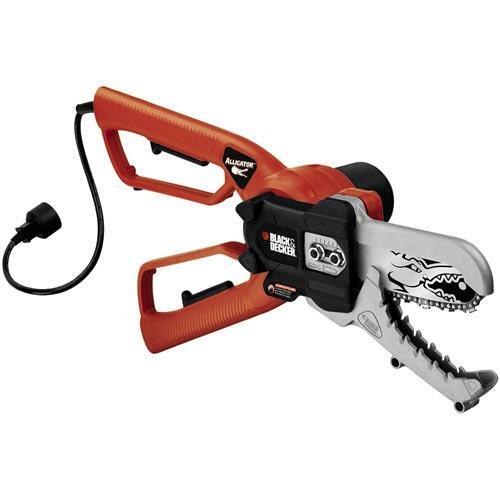 It does look cool, but it is essentially a chainsaw-lite for people who can't use chainsaws. Yeah I does kind of go against Darwinism. Could've used a gas powered one a few years ago while cleaning up our mountain bike trails after a hurricane. Tree crowns are probably the most dangerous part of the tree to stick a chainsaw into. Lot's of places to catch a tip and get a kickback. I brought this thing up here once before. Not! I used a real chainsaw. I was thinking it would be nice to have one for when guys like you come out to help. Yeah but that don't count, H8R's thread is cooler..... Sounds like you need a bit of debunching! Debunching used to be grab-and-shear. Now it's grab-and-rip-the-fvck-up. A chainsaw lacks this important function.